Internationalization can be achieved by using i18n bundle approach in adobe CQ or AEM(Adobe Experience Manager). Based on our use-case/requirement their are different approaches to implement internationalization in adobe cq. If we want to display certain text in different language based on URL,page language or region detected by browser. Then we should use internationalization feature of CQ. Create a i18n node under /apps/<myapp>/ of type sling:Folder. Create a node with name as language code (fr) of type sling:Folder under i18n. Add property jcr:language and assign value of lang code or lang_COUNTRY. Add mixin type as mix:language. Note:- By adding mixin type we enforced that along with sling:folder this node has addition behavior for mix languages. Select Language Node (fr) –> Right click and create new node of type sling:messageEntry and add below properties on this node. |    +-- jcr:language = "en"
|    |    +-- sling:key = "hello_world"
|    |    +-- sling:message = "Hello world!" |         +-- sling:key - "goodbye"
|         +-- sling:message = "Goodbye!" |    +-- sling:key = "hello_world"
|    +-- sling:message = "Bonjour tout le monde!" +-- sling:message = "Au revoir!" Detailed explanation of each method used in Below program. When the <sling:defineObjects /> tag is used within a JSP page, the slingRequest value is created. The slingRequest implements the SlingHttpServletRequest interface and has couple of useful methods for internationalization: getLocale(), getLocales(), getResourceBundle(Locale), and getResourceBundle(String, Locale). The getLocale() method gets the default Locale of the request. The getLocales() method gets all of the methods for a request. Typically the value for these come from the browser. The method, getResourceBundle(Locale), gets a ResourceBundle instance that has all of the found key/value pairs for the locale. The method, getResourceBundle(String, Locale), gets a ResourceBundle with all of the key/value pairs for a base name and a locale. The ResourceBundle interface has a method, getString(String), in which the argument is the key and the value of the key is returned. If the ResourceBundle does not have that key, the value returned is the key itself. One thing to keep in mind is that a ResourceBundle is not the same thing as an OSGi bundle. They are two different concepts using the same name. That’s it. Now this jsp page will be rendered according to page language or region detected by browser. Note:- You can see that your training dictionary is also added to it. First priority goes to project dictionary if no match found then it looks in global dictionary available in aem. 10 Responses to "Implement Internationalization in Adobe CQ"
Can you please show how to get sling:message value in sightly? When using Approach 1 and apply what described there to internationalize error messages in a form it works fine, but not when there’s a dispatcher between you and the aem publish. What’s the problem with dispatcher? Is there some config to add for the locale in the js? 500 ReferenceError: “Granite” is not defined. Maybe I have to import something? There is a file called I18n.js inside etc/clientlibs/granite/utils, but I couldn’t import those files (maybe I just did it the wrong way). Hi, I am confused what should we use internationalization or translation service provider for multilingual website? 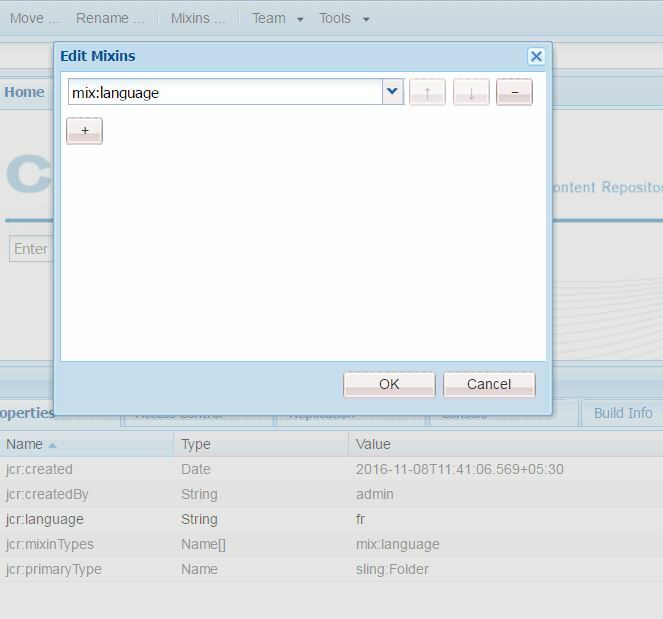 Hi Ankur , I am using AEM6.2 and I followed all the steps mentioned above by you correctly but I was not able to implement the internationalization feature in AEM. Later I understood the folder type for i18n and its child folders i.e language should be of the type nt:folder & not sling:folder. Now am able test the internationalization feature as per the above steps mentioned . I hope this is the right way to implement and it will help other new beginners , please suggest. Where this i18n values stored?